Whether it’s mental, written on an envelope or meticulously documented in a spreadsheet, a list of pros and cons often plays a role in the purchase of a new car. What’s the mileage like? How safe is it? How’s it look? If a shopper was weighing whether or not to buy a natural gas-fueled car, the top item on the “pro” side would without a doubt be the cost of fuel: right now the gallon-equivalent of compressed natural gas costs less than half as much as a gallon of gasoline. That is, if you can find a place to fill up. Because the top “con” would be the fact there are only a dozen publicly-accessible natural gas fueling stations in Pennsylvania. That $1.75-a-gallon price tag doesn’t look so great when you’re stranded on the side of the Turnpike with an empty fuel tank. The Corbett Administration has made expanding the number of natural gas-fueled vehicles on Pennsylvania roads a priority, and is preparing to spend $20 million on the effort over the next three years. Governor Corbett’s motivations are three-fold: natural gas-run vehicles release far fewer emissions into the air than gasoline or diesel cars and trucks; they’re also a step, he argues, in the direction of American energy independence. Corbett also has an economic incentive. “The more we create demand for the natural gas, hopefully we’ll see that cost of dry natural gas go up some, so that [energy companies] continue to drill,” he said during a June press conference. The glut of supply created by a shale gas boom has driven down the cost of natural gas to ten-year lows. Many drillers are responding by slowing down extraction operations. That lack of stations is the downside of a natural gas vehicle. There aren’t too many places to fill up — just 11 stations are open to the public in Pennsylvania — because not many people are using natural gas. The 110,000 natural gas cars and trucks on the road account for .0006 percent of all American vehicles. Click here for an interactive map of Pennsylvania’s public CNG stations. Most of Pennsylvania’s CNG fueling stations are operated by private companies like PECO, which already have the infrastructure in place to fuel the CNG trucks in their fleet. Waste Management and supermarket chain Giant Eagle also operate facilities. 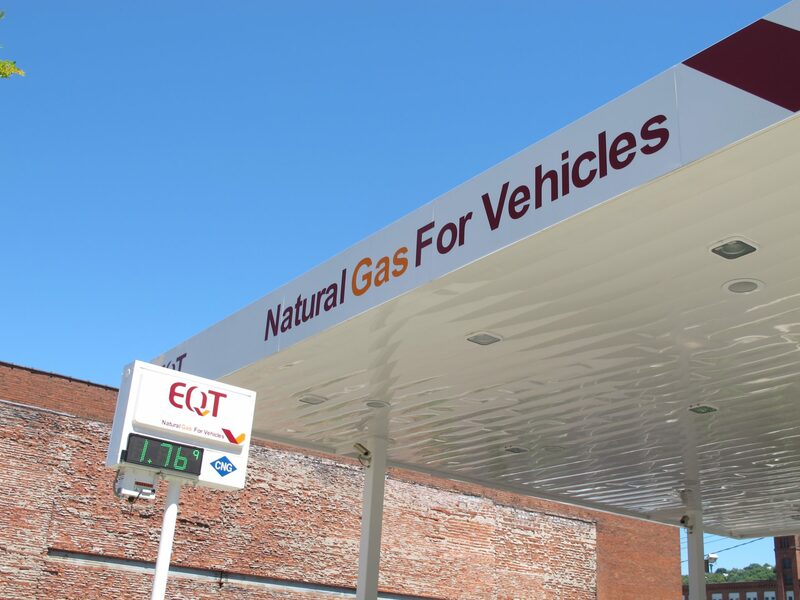 EQT’s CNG station in Pittsburgh’s Strip District is the most high-profile fueling stop in the state. It got a lot of coverage when it opened earlier this year. But over the course of an hour on a Wednesday afternoon in June, more cars and trucks pulled into the lot to turn around than to fill up. Just three vehicles refueled: a taxi, and two vans owned by an electric company. The traffic was indicative of the current natural gas market, which dominated by fleet vehicles. This is the area where experts expect to see the most growth over the coming years. The conversion is happening in Washington County, where Waste Management parks a fleet of more than thirty CNG-fueled garbage trucks. The company is in the midst of a national effort to convert all its vehicles to natural gas. Waste Management has been running an all-natural gas fleet in California for a decade, because of the state’s tough vehicle emissions standards. As national regulations have gotten stricter, diesel trucks have grown more expensive. Waste Management decided it made more sense to purchase natural gas trucks. The company earns back the cost difference within two years, though, since garbage trucks burn through so much fuel. It takes longer for private car owners to turn the higher cost into a savings. A CNG-fueled Honda Civic – the only natural gas-only car currently on the market – costs $6,000 to $8,000 more than its gasoline-fueled counterpart. Washington County Honda general manager Gary Flannery, who started carrying the CNG vehicles in June, estimated it would take between 60,000 to 80,0000 miles of driving for the savings to kick in. Flannery expects to sell two to three CNG Civics a month. In fact, Honda has only sold 14,000 of the vehicles since 1998, when the company began manufacturing them. It’s moved 4.2 million standard Civics during that same timespan. The potentially prohibitive upfront cost is the reason why the Corbett Administration is preparing to dole out $20 million in grants to companies, local governments, colleges and other groups who purchase natural gas-fueled trucks over the next three years. The money comes from Pennsylvania’s new impact fee on natural gas drillers. Companies, governments or schools who are adding more than five natural gas-fueled trucks can apply for grants of up to $25,000-per-vehicle. While cars aren’t part of the program, an already-existing fund provides a $1,000 rebate for natural gas-fueled car purchases. Dan Lapato, who’s helping run the grant program at the Department of Environmental Protection, said converting large fleets from diesel to natural gas will improve air quality. “When you get into a suburban/urban area, where you have the traffic from busses, from vehicles, from cars, the impact on air quality could be huge. …The diesel emissions vs. the natural gas emissions. there’s a vast difference between the tailpipes,” he said. The department hasn’t set a specific goal for the number of natural gas vehicles it wants to put on the road. Lapato said the effort is designed to raise awareness for natural gas-run cars and trucks, alongside beefing up the market. That’s why DEP will host public information sessions on natural gas-run vehicles, beginning this fall. The Department plans to begin accepting grant applications in December. Just How Much Gas Lies Beneath Bucks County?